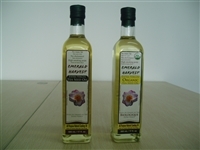 Camellia Oil-Brichem (Haikou) Co. Ltd.
Camellia oil is refined from the seeds of the Camellia tree (Camellia oleifera). Camellia oil is fragrant with a sweet herbal aroma and pale-green hue. This oil is produced by cold-pressing, pure physical process. It is used as both a culinary oil and an ingredient of cosmetics. Camellia oil is a natural oil that does not contain aflatoxins or other additives, but is rich in monounsaturated oleic acid and other antioxidants. Packing and storage: packed in metal drum, 50kg/drum, store in a cool, dry place and prevented from light. Shelf life: 18 months. Applications: as skin and hair moisturizers.